Pile on the fruit for our Strawberry-Rhubarb Cake recipe. 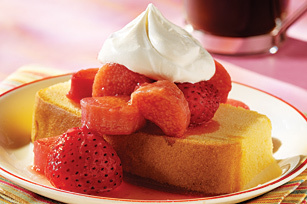 This Strawberry-Rhubarb Cake combines pound cake and sweet, tender strawberries and rhubarb. Cook rhubarb, strawberries, sugar and water in saucepan on medium heat 5 min. or until rhubarb is desired tenderness, stirring frequently. Cool slightly. Spoon about 1/4 cup rhubarb mixture over each cake slice just before serving; top with 2 Tbsp. COOL WHIP. For a sweeter dessert, prepare using 1/2 cup sugar.